What is the root cause of the explosion of consumer debt in the developed countries that led to the financial crisis? Why did China choose an export-led growth strategy? What is the real reason for lopsided international trade where some countries run up huge surpluses while others notch up massive deficits? The United Nations Conference on Trade and Development (Unctad) has one answer to all these questions: The lack of domestic demand. It is because real wages have stagnated in the US that it tried to compensate by lowering interest rates so that the masses relied on borrowing for consumption. Increasing the prices of homes, which were used as collateral for borrowing, was one way to do it. Higher borrowing became a substitute for higher incomes. This is the thesis propounded by Unctad’s latest Trade and Development Report, released a couple of days ago. It says that wage growth is the main driver of domestic demand in all countries, but wages have been depressed in the developed nations for a very long time. The report states clearly that “the main global risk is that wages and mass incomes may not increase sufficiently to feed a sustainable and globally balanced process of growth based on domestic demand". It says that wages as a share of national income in the developed economies has been steadily going down. This matches with what economists have been pointing out for a long time. For instance, in a recent report, Gerard Minack, Morgan Stanley’s global market strategist, says that the wage share of GDP in the US is at a fifty-year low. The share of profits, on the other hand, is at multi-decade highs. The Unctad report gives a table on real wage growth in selected countries since 2001. I’ve taken the data for real GDP growth from the International Monetary Fund (IMF) database and compared it with the numbers for real wage growth. The results are interesting. For the US, growth in real GDP during 2001-05 averaged 2.4%, but growth in real wages, according to Unctad, was -0.3% annually. Real wages lagged real GDP growth in 2006 and 2007, but did better during the recession in 2008 and 2009. A similar pattern was seen in Japan as well. For China, real wage growth has been higher than GDP growth over most of the period. Between 2001 and 2005, average growth of GDP was 9.8%, but Unctad’s figures put real wage growth at 12.6% annually. Real wage growth outstripped real GDP growth in China in 2006, 2008 and 2009. More recently, there have been many news stories about how workers in China have been able to get large raises. The story for India, however, is very different. 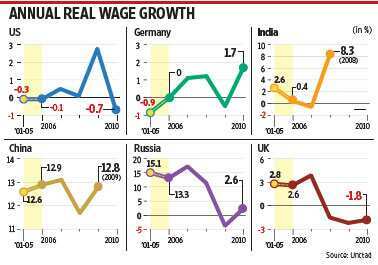 According to the Unctad figures, growth of real wages in India between 2001 and 2005 was a mere 2.6% annually. If we take the IMF database numbers, the average real GDP growth in India during the period was much higher, at 6.5%. Real wages grew at abysmal rates of 0.4% in 2006 and -0.6% in 2007, far lower than the GDP growth rates during this boom period. It was only in 2008 that real wage rates went up by 8.3%, much higher than the GDP growth rate, which suffered on account of the financial crisis. If Unctad’s numbers are right, then large sections of the population haven’t really benefited from the high growth rates of the last decade, although anecdotal evidence suggests that demand for skilled labour is high. The lower share of wages could also account for the declining share of private consumption in India’s GDP. This is not the first time that economists have drawn attention to labour’s steadily falling share of national income in the developed nations. But the problem now is that, as a result of the financial crisis, these economies are very fragile. Levels of consumer debt are high, which means consumers are reluctant to take on more debt, even at low rates of interest. Unctad says the insistence on cutting public spending in the developed economies will keep unemployment high, which in turn will depress wages and keep private sector consumption low, depressing growth. Moreover, Unctad also warns that while the recovery has been led by higher wages in the developing countries, that might change as the slowdown in the West could lead to lower growth in emerging markets as well. Unctad points out that when wages grow less than productivity, it implies that domestic demand is lower than potential supply. The gap can be filled in two ways—by exports, or by stimulating demand by credit easing. Both these strategies have been tried and proved to be unsustainable. At best, they lead to bubbles, while at worst they could degenerate into trade and currency wars. Policymakers, unfortunately, seem to be paying little heed to Unctad’s advice.